Here is a picture of me and my bike with only the windshield added. This Thursday, I plan on getting Cobra pipes, saddle bags, backrest, engine guard and visor lights. Finally the wait is over! After 2 and a half hours of washing and scrubbing and buffing I have pride in my ride! There was quite a jewel underneath all the dirt and grease. I am so proud of this bike and how it came out. She runs like a top and looks awesome now too! I have added a fork bag that matches the saddlebags. That pic will be too you soon. The above pics are of my (fairly) recently acquired Shadow VT600C. The first three are different angles of the bike, the fourth is of my daughter on it and the last is of me the proud owner. 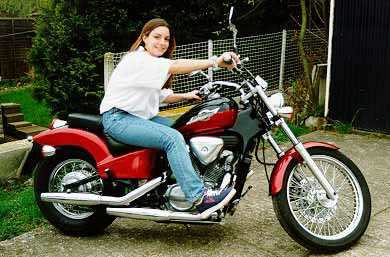 The only customisations to the bike are a sissy bar and some chrome lens covers to the rear light & the indicators which also have blue-dot lenses - the photos were taken before the changes to the indicators. I live in the south of England and use the bike most days to get to work except in the worst of the weather. The best ride at the weekends is to Box Hill, Surrey - the most famous meeting place for bikers in the south of England. Several hundred bikes of all styles & ages turn up every Sunday throughout the day - it also attracts the police in large numbers. The picture on the hills was taken on Highway 35 (also known as Skyline Blvd) in Palo Alto / Saratoga Hills. It is a very beautiful route and the ride is fun. Further up the road where 35 meets 84 is Alice's restaraunt - a biker hangout. The bike is a 95 Shadow 600 VLX Deluxe, the picture was taken at Deals Gap while I was at the Honda Hoot last summer. 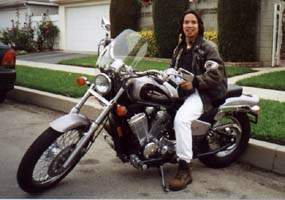 The picture with me is from my trip to the Honda Hoot 96. The trek took me from Fort Collins, Colorado to Nashville, North Cartolina. 1500 miles on a 600. I need an ACE!! Hello!!! I'dont speak english :( Puede alguien leerme? Es que ni siquiera se bien a donde me comunico.Disculpen. Mi name is Sergio Merino, 25 years This is my dear vlx. Ahi van mis dos amores: mi vlx y mi novia. Espero que alguien pueda leerme. Otra vez disculpas. Sergio is from Argentina... and doesn't speak any English... but whatever he is saying, we know what he means! Don't we? Love the bike Sergio. Sitting on my bike... I can see you all surfing in the cyberspace. Started from Verona (Italy), the place where I physically live, I finally reached my destination, here in the web of the shadowmen. It was a long long ride but it was worth while. Be good on the back of your bike !